Where are you based? Where can I rent a bike from? Our head office is based in Nelson, at the top of the South Island, the geographic centre of New Zealand. We live here because the riding, the scenery, and the weather, are fantastic.. 🙂 All of our Guided Tours start in Nelson. Nelson is where Air New Zealand service their national fleet, so there are a ton of inexpensive, short flights to Nelson from Christchurch or Auckland. If booked in advance, a 70 minute Auckland to Nelson flight costs around NZ$120 per person. A 40 minute Christchurch to Nelson flight is approx $90 per person. We’re happy to book these for you. You can pick up or drop off your rental bike in Auckland, Nelson, or Christchurch. 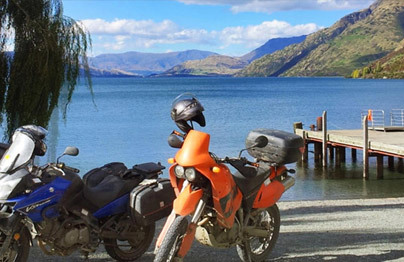 You’ll get the best pricing if you pickup and drop off your bike in Nelson, but it’s no problem if you want to use one of the other centres – just be aware that the usual rental industry one way drop off fees do apply. We offer an airfare subsidy on certain rental bookings that start and finish in Nelson – please enquire for details. My wife is undecided whether to ride two up or rent her own bike. A little background. She commuted for two years on a Yam 650 in the mid 1970’s. 80 miles a day rain or shine, April – Sept (our good riding months). Not any riding until last year when she put 400 or 500 miles on my Trophy4, (tried a Yam FZR600 but it was taller than the Trophy). Decided it was too tall (especially when stopped at an off camber uphill stop sign) just didn’t like being on her toes, she’s 5′ 5″. Felt it was also top heavy, which probably goes back to her height. She just wasn’t comfortable. Yes she’s told me to get rid of one bike and then she would purchase something that suited her. She does have a motorcycle license. The question is would you allow her to use one of your bikes given the above and if so do you have a bike that would fit her, with a screen or fairing and either a tank bag or top boot to hold some camera equipment? We had a recently retired ballerina from New York with similar experience tour with us last year with her husband. We put her on a cruiser with a very low seat. She was 5′ 2″, 100lbs. We’re talking Tiny with a capital T. We gave her a bit of time on the bike in a quiet area, and then asked us to show she could stop and turn well, and weave in and out of some cones that a confident rider could tackle with ease. She passed that and decided to ride. She was a little nervous, but rode well. There was the odd very windy day where she opted to put the bike on the rescue trailer and rode in the van with me. As long as your wife is feeling confident she can handle the bike, and that she can demonstrate to both us and you to our mutual satisfaction that she is in safe control we dont have a problem. If she has an unrestricted motorcycle licence, our insurance company is happy, so there’s no problem there either. Ellen (ballerina) went home a much better rider and learnt a lot. 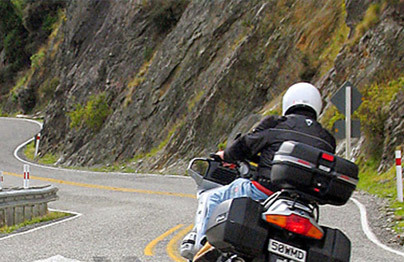 We hold advanced rider instruction days at our dealership (Thunderbike) and though we’re not trained motorcycle instructors, we feel we have a good grounding in motorcycle riding and survival skills and we enjoy passing these on to others. If we see somebody on the tour who we think can benefit from a bit of help (and they willing to listen) we’re quite happy to share our knowledge. Though we don’t recommend that a rider takes one of our tours to learn how to ride, it may benefit your wife to ride and hone up her skills again. There’s no doubt she’ll go home well practised in twisty roads 🙂 and a better rider. Our aim is to make the time you spend on one of our bikes a real treat. We use a mix of prestigious makes and models from Triumph, Harley Davidson, BMW, Honda and Suzuki and we are adding to our fleet all the time. We try wherever possible to give our clients the choice of several different types and makes of motorcycles, all in as new, pristine condition. Once the mileage gets over 18,000 miles, or they start to show signs of wear and tear, we pension ’em off. We do keep a few 4 year old, excellent condition bikes for those who are prepared to trade off the need for the latest and greatest for a reduced daily rental rate, but most of our bikes are current models and are less than 18 months old. Brett was also asking how much it would cost to do the Self-Guided Tour. I seem to recall that you don’t bring our luggage along on that one, basically we just rent the bike? I think that, regardless, we’d still like the planned tour. On a Self Guided Tour, the price is determined by the amount of involvement we have, the type of accommodation, meals, activities you want included etc. A Custom SGT is a very personalised tour, built to your specific requirements. A Fixed Itinerary SGT is more like a dining in a buffet restaurant – you get a great price, but everything has already been pre-prepared and planned in advance. On either Self Guided option, you ride alone, no guide or chase van, carry your own luggage etc..but you have all of our special knowledge and information with you in your SGT itinerary booklet. All your accommodation is prebooked and pre-paid.. and we still provide the detailed personalised touring notes as on the Guided tour. You can have us organise most of your meals, or you can just follow our suggestions. 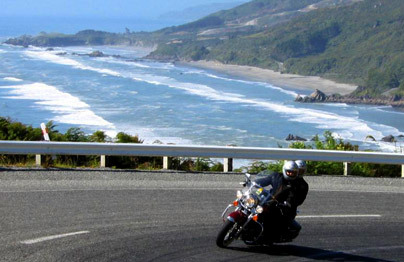 A typical 14 day Fixed Itinerary SGT with all accom, some breakfasts, works out at around NZ$600 per day for a couple, depending upon the type of bike chose and level of accommodation required. SGT’s are a good way to save a few bucks over a Guided tour, and clients have enjoyed them tremendously, but I feel that a Guided Tour has significant additional benefits. Surprisingly, the benefit most people enjoy the most, is that of not having to worry about your luggage – you can bring all the clothes you like without having to compromise, and the bikes are more fun to ride. Additionally, the social interaction and friendships that develop on a Guided tour, is missed on a SGT – it’s nice to sit in a bar round a fire with a beer or wine at the end of a day, and swap stories. Lastly of course, you miss out on the on demand assistance that the guide is there to provide, whether it be information on where to exchange currency, where you can get a decent cup of coffee, or helping you when you unluckily suffer a puncture. Finally, part of the cancellation policy was cut-off. I cannot read the rest of it. Not that we want to cancel, but it is good to know what our options are! The cancellation policy conditions can be found on the bottom of the Booking Forms. Try here: Guided Booking Form or here: Self Guided Booking Form. How many nights lodging are included in the “14 Day” Tour? 15 nights on a 14 day tour, and 13 nights on a 12 day tour. One night pre-tour, AND also the night the tour finishes. If you’re cross checking prices with other operators, check that they are doing the same. Most don’t. What is the Cost of the Milford Sound Boat Cruise?